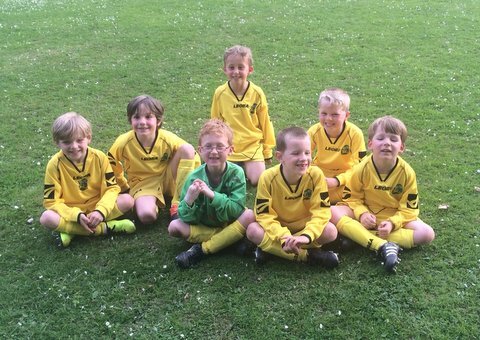 U5/U6 football will start for the 2018 / 2019 season at Langton Green Rec. on Saturday 1st September at 10am. You're very welcome to bring your son or daughter along for a couple of trial sessions to see if they like it first. "Football is great fun and I love it, I just can’t wait for next week..."
We really hope that children enjoy their first experience of football at our club. It is all about having fun while training and participating in this wonderful team sport. On Saturday mornings we provide football coaching sessions for boys and girls of 4, 5 and 6 years of age and of all abilities. These sessions are run by experienced coaches. The Under 5’s (Reception class at school) and Under 6’s (Year 1) start with a warm-up session together where listening skills and the ability to follow simple instructions is important. We then separate them into their appropriate age groups for skills training, where balance and co-ordination is developed using stages in ball control, dribbling, trapping and shooting. Then after a short break the children take part in some small-sided matches with an emphasis on sportsmanship, playing in a team and introducing the basic rules of the game. The sessions start at 10.00am at the Langton Rec. and finish at 11.15am for the U5’s and 12.00 noon for the U6’s. At this age group we ask that a parent/guardian for each child stays for the whole session. Any parents / guardians who would like to help are positively encouraged to join in. The club is run entirely by volunteers and the active participation of parents and guardians is critical to its continued success. We are very pleased that many of the children who start at this age group stay with the club and progress through different age levels and teams with the same core group of boys. Please make sure that the children come with boots, kit, shin pads and bags of energy! Don’t forget to dress them in track-suit bottoms and warmer tops in the colder weather. We have plenty of hot and cold drinks and snacks for sale. If the ground and weather conditions are such that the pitches are not playable we do move to all-weather pitches along with the other Saturday morning age groups. Any location changes are announced on the web-site as early as possible.